As a woman, we are constantly one bag, one dress or one pair of shoes short. Anyhoo, after buying 4 custom crocodile totes earlier this year, I told myself I exceeded handbag quota for the year. Nevertheless, I find myself in adoration with this bright blue Balenciaga tote after seeing gal pal's new grey Balenciaga. See, it is not my fault at all. I did not go to seek this bag out. I really like the size, which is not too big or small at 13" x 7.5" x 2.5". The lizard embossed detail gave this tote added unique detail. On top of everything, an adorable ballet flat key chain is free with purchase. Sigh.... perhaps this holiday as a gift to myself. Available at Balenciaga for $1245. What do you think? Speaking of holiday, I know this is sorta early but I vow to sent out holiday cards to friends and family instead of e-cards or Facebook people with holiday wishes. There is something nice about a card or letter via snail mail. 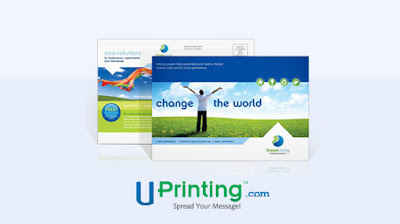 With this being said, the nice folks over at UPrinting is offering one lucky Savvy Mode reader a chance to receive a set of 100 postcards for the holiday. The winner can customize the printing. For me, I love the convenience of online printing for business cards. The winner will have the convenience of postcard printing from the comfort of home. 2. Open to US Resident 18 year and older from Oct 16 to Oct 20, 2011. 4. Share this giveaway to receive extra entries. *Sponsored by UPrinting, no monetary compensation was given to me but I will receive a postcard for hosting this giveaway. i hope i win this for my sis in tx! so dat she can print out her blog bizness card! What an incredible giveaway. That's a great bag! Good look to all of the entrants. What is not to love with that bag? It's beautiful!!! I love the design, its bright blue color and its keychain is adorable. That thing caught my eyes and my heart! Love it!!! The bag is so cool especially the lizard embossing. this is SO up my alley. I send a card every year since forever and then last year I sent a post card with a photo of the baby since so many people hadn't met her yet...PLUS, I send apost card to clients so winning this would be a major treat. and ps---FOUR custom bags in one year! you lucky girl. And, croc! BEYOND fabulous. this blue Balenciaga is to die for. I love the unusual color.